Para-virtualized drivers are available for virtualized Windows guests running on KVM hosts. These para-virtualized drivers are included in the virtio package. The virtio package supports block (storage) devices and network interface controllers. Para-virtualized drivers enhance the performance of fully virtualized guests. With the para-virtualized drivers guest I/O latency decreases and throughput increases to near bare-metal levels. It is recommended to use the para-virtualized drivers for fully virtualized guests running I/O heavy tasks and applications. Any 2.6.27 or newer kernel. Newer Ubuntu, CentOS, Red Hat Enterprise Linux. Those versions of Linux detect and install the drivers so additional installation steps are not required. This section covers the installation process for the KVM Windows para-virtualized drivers. The KVM para-virtualized drivers can be loaded during the Windows installation or installed after the guest is installed. using a virtualized floppy device to install the drivers during boot time (for Windows guests). This guide describes installation from the para-virtualized installer disk as a virtualized CD-ROM device. The virtio-win package contains the para-virtualized block and network drivers for all should work Windows guests. Download the virtio-win package with the yum command. The drivers are also from Microsoft (windowsservercatalog.com). 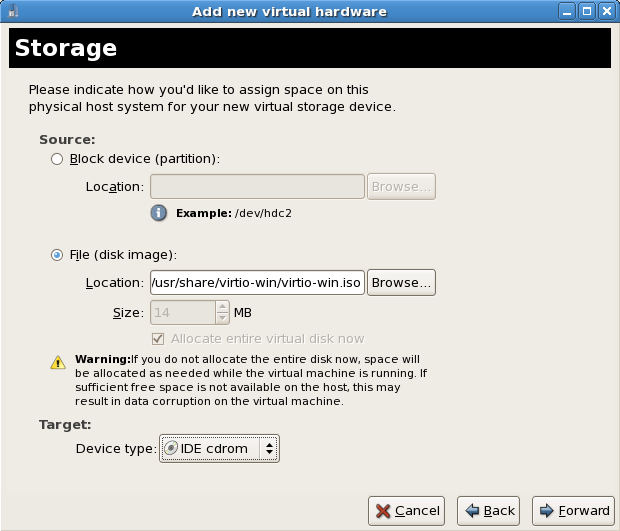 The virtio-win package installs a CD-ROM image, virtio-win.iso, in the /usr/share/virtio-win/ directory. It is recommended to install the drivers on the guest before attaching or modifying a device to use the para-virtualized drivers. 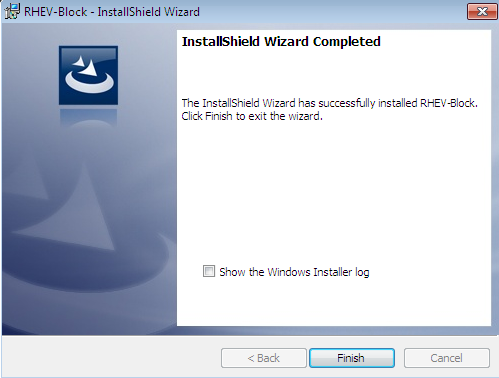 For block devices storing root file systems or other block devices required for booting the guest, the drivers must be installed before the device is modified. If the drivers are not installed on the guest and the driver is set to the virtio driver the guest will not boot. 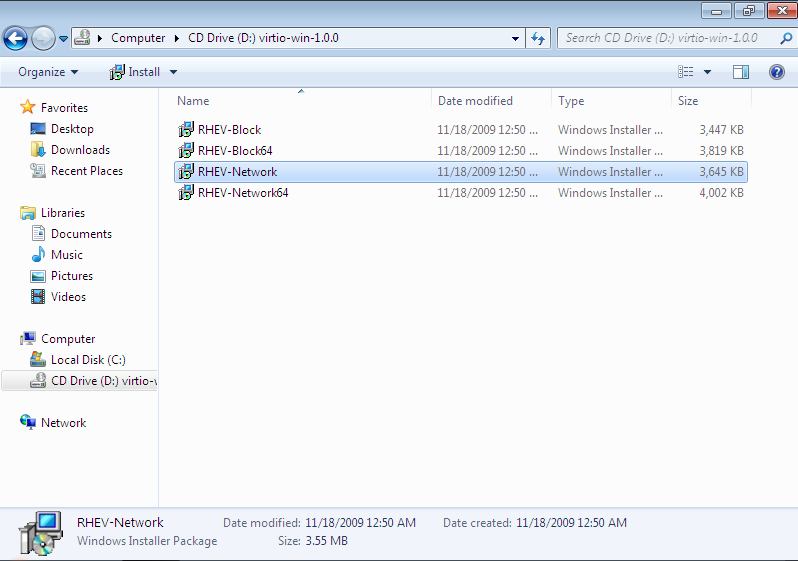 This procedure covers installing the para-virtualized drivers with a virtualized CD-ROM after Windows is installed. 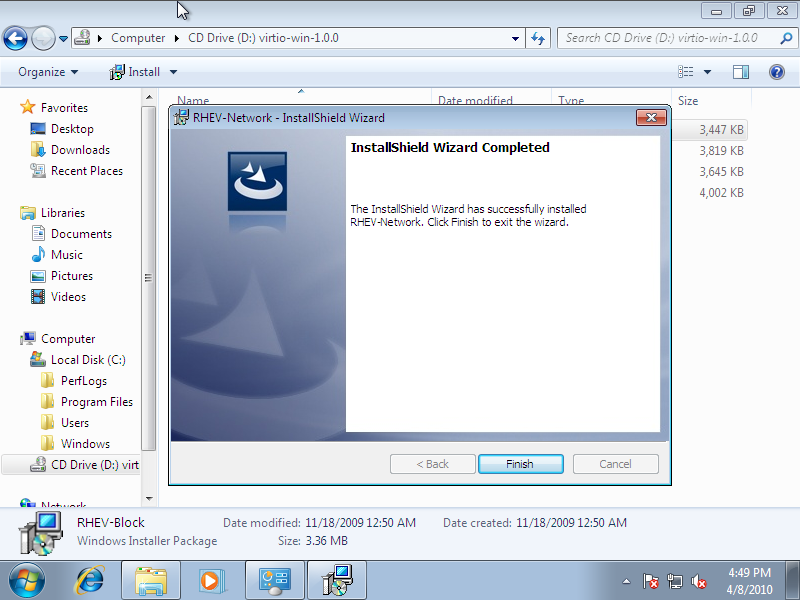 Follow Procedure 12.1, “Using virt-manager to mount a CD-ROM image for a Windows guest” to add a CD-ROM image with virt-manager and then install the drivers. Open virt-manager, select your virtualized guest from the list by double clicking the guest name. Click the Add Hardware button in the Hardware tab. This opens a wizard for adding the new device. Select Storage from the dropdown menu. Click the Forward button to proceed. Choose the File (disk image) option and set the file location of the para-virtualized drivers .iso image file. The location file is named /usr/share/virtio-win/virtio-win.iso. If the drivers are stored on a physical CD-ROM, use the Normal Disk Partition option. Set the Device type to IDE cdrom and click Forward to proceed. The disk has been assigned and is available for the guest once the guest is started. Click Finish to close the wizard or back if you made a mistake. Reboot or start the guest to add the new device. 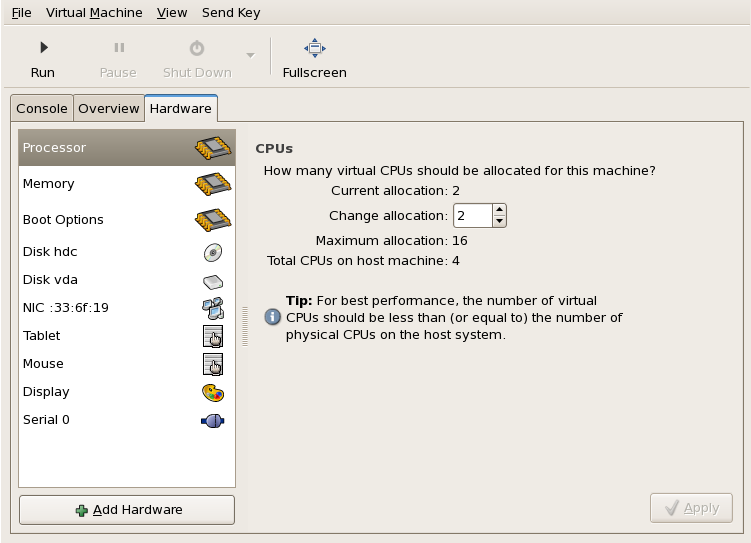 Virtualized IDE devices require a restart before they can be recognized by guests. Once the CD-ROM with the drivers is attached and the guest has started, proceed with Procedure 12.2, “Windows installation”. On the Windows guest, open My Computer and select the CD-ROM drive. or both the block and network device drivers. 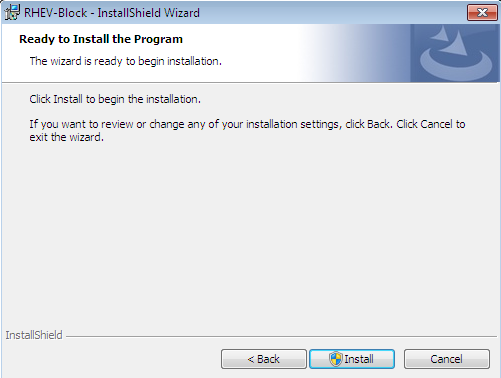 Double click the installation files to install the drivers. Double click RHEV-Block.msi or RHEV-Block64.msi. 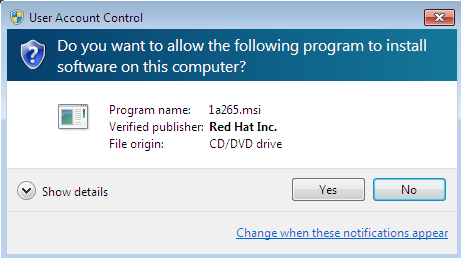 Windows may prompt for a security exception. Press Yes if it is correct. 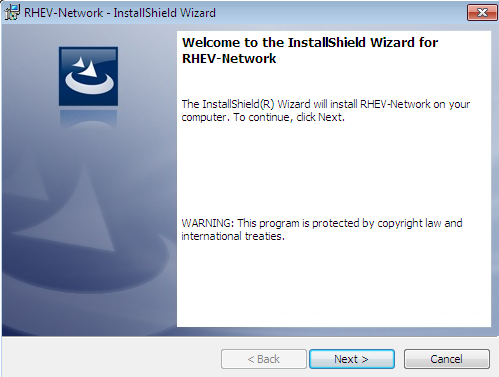 Double click RHEV-Network.msi or RHEV-Network64.msi. 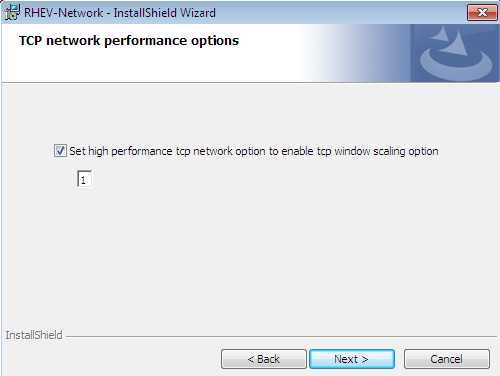 This screen configures advanced TCP settings for the network driver. TCP timestamps and TCP window scaling can be enabled or disabled. The default is, 1, for window scaling to be enabled. TCP window scaling is covered by IETF RFC 1323. The RFC defines a method of increasing the receive window size to a size greater than the default maximum of 65,535 bytes up to a new maximum of 1 gigabyte (1,073,741,824 bytes). TCP window scaling allows networks to transfer at closer to theoretical network bandwidth limits. Larger receive windows may not be should work by some networking hardware or operating systems. TCP timestamps are also defined by IETF RFC 1323. TCP timestamps are used to better calculate Return Travel Time estimates by embedding timing information is embedded in packets. TCP timestamps help the system to adapt to changing traffic levels and avoid congestion issues on busy networks. 0 Disable TCP timestamps and window scaling. 1 Enable TCP window scaling. 3 Enable TCP timestamps and window scaling. Reboot the guest to complete the driver installation. Change the device configuration to use the para-virtualized drivers (Section 12.3, “Using KVM para-virtualized drivers for existing devices”) or install a new device which uses the para-virtualized drivers (Section 12.4, “Using KVM para-virtualized drivers for new devices”).